One of the reasons that i love Spanish wines because they original. Spain has an amazing collection of wine varietals which are not exploited on their advantage. The problem that i have in Rueda is Miss Sauvignon Blanc. Dont get me wrong, I like Sauvignon Blanc from Sancerre, or Bordeaux. But Rueda has a such a magnificent territory in a high altitude climate, so why give such and importance to Sauvignon Blanc? My sudden uneasiness with Sauvignon Blanc goes with the recent world Sauvignon contest held in Tordesillas. A selection of Spanish Sauvignons Blanc received a warm reception. These included Mantel Blanco and Palacio de Bornos from the 2015 vintage. Other wines selected by Spanish master of wine, Pedro Ballesteros were received well. Sauvignon Blanc was introduced in Rueda by the Marques de Riscal in 1974. Then, it was felt that the appellation needed a dynamic fresh look in the International markets. Emile Peynaud was brought to consult and being the good Bordelais, dismissed the Verdejo variety. Verdejo is prone to oxydation, and he reccomend to replace by Sauvignon Blanc if Rueda wanted to succed it. Today, Rueda is doing well in the Spanish wine Industry. The Europeans specially the Germans like Rueda. However, the long term sucess of the appellation will rest of the promotion of native varieties. Aromas that bring to mind citric fruits, green apples with nuances of fresh coriander and a hint of almond with anis spice. On the mouth, structured and balanced with a complex and refreshing finale. Excellent with seafood asiatic based soups. 90/100. This Rueda is the seventh wine of the line of Chartier to appear in the SAQ shelves. This Rueda comes from very old vines of Verdejo ( 75 years old+). The soil in which the wine is born is similar to Châteauneuf-du-Pape, red pebbles, which tend to absorb the heat and distribute to the vines. Chartier uses indigenous yeast to vinify and the wines mostly spent his time in inox with a short time ( 3 months) in its lees. The idea from this post came from an observation from my mother. The other day I was making fish and chips. For my fish, i used fresh cod which she complained that it tasted anything. In her mind, the idea of savoury cod was the one that was salted and left in water for a few days before cooking. This got me thinking about it, which was a regular dish during Easter when i was a child in Venezuela, so i thought about dropping a line or two about the subject. Coming from an Italian family, this was a traditional dish that we used to have every good friday. Easter is coming soon and I thought that it would be just appropiate to talk about a dish that is very famous in Spanish Gastronomy. Bacalao or Salt Cod. Salted dry cod cut at the Boqueria market in Barcelona. Salt cod, a popular Good Friday dish in many parts of the Mediterranean, is cooked many different ways which suggest different wine pairings. 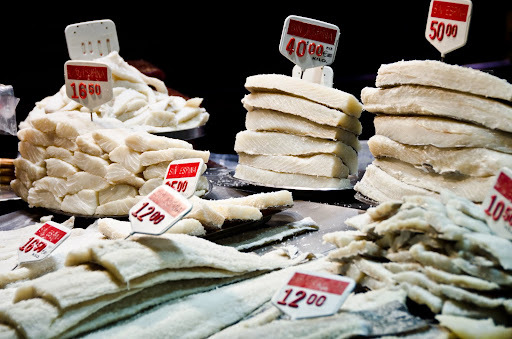 Pairing salt cod (bacalao) with wine is a tricky business, and one can go seriously wrong. Salt cod’s high salinity and complexity of the way it is normally cooked with other flavors such as onion, tomatoes, potatoes, olives, olive oil, etc. make it tough to find a wine that stands up to the flavors and that complements them. In this post, I will give 3 reccomendations for some of my favorite white wines. On a later one, I will discuss pairings with red and orange wine. Chardonnay (unoaked) – Chardonnay has a consistent structure and an agreeable freshness. It works well with dishes containing flaked salt cod which normally retains more salt than filets of salt cod. Carménère – This Chilean red-wine varietal stands up well to salt cod dishes which contain green peppers, a notoriously tricky flavor when it comes to wine pairings. Pinot Noir – This grape, known for its smoothness and balance, is recommended when salt cod is roasted or served with few other flavors. The Lurton brothers are a powerhouse trio. They make wine across the globe in Argentina, Chile, France and of course of Spain. This Verdejo offers a mix of white and citrus fruits with subtle notes of green pepper. On the mouth, the wine is medium to full body. Fresh with more citrus fruits and a nice mineral undertone. Good quality for the price paid. Will pair nicely with cod preparations involving baked onions and green pepper. 92\100. Appreciation can be defined as -.the recognition and enjoyment of the good qualities of someone or something-. For something to be appreciated if we go by this definition, it has to comply with this two conditions. In the Spanish wine industry, there are many wine regions that enjoy appreciation. These include Rioja, Ribera Del Duero and Cava. Others are not so fortunate. This is the case of Valdepenas, Extremadura, Txacoli and which brings to the last one Rueda. Rueda is the favorite white of the Spanish people. One important reason is that their wines cost as much as half less than their competitors their Albarinos from Galicia. The other notable reason is the character of the Verdejo grape. It is fruity with aromas of mountain herbs or scrub. On the mouth, it has a volume with a good acidity and its trademark bitter finish. Spaniards love their Rueda with roasted fish and fried calamars. In madrid, it is also popular with tapas of tortilla, ham and cod croquettes and patatas bravas. The acidity of the Verdejo cleanses the palate from the greasy sensation of fried food and has the body to stand to the bold flavors of some of this dishes. It origins go back to the king Alfonso VI in the XI century in the basin of the Duero river. The Spanish monarch is attributed to have developed winemaking in the region. He developed winemaking in the region to supply its court. After phylloxera wiped out most of the vineyards in the early 1920’s, Rueda was replanted with the most productive grape Palomino. In the 1970’s, Marques de Riscal from Rioja replanted a good part of the vineyard area again with the verdejo grape. Thus, the modern era of Rueda began. In 1980, Rueda was granted appellation status. Despite its long historical winemaking tradition, Rueda does not get the recognition that it deserves. Well, there is a number of reasons. Geographically, Rueda it is in disadvantage. The appellation is squeezed betwen Cigales, Toro and the infamous Ribera del Duero appellations. All of these places produces red wine. In addition, Rueda is not as picturesque as Segovia and Avila. Moreover in the 1980’s, the appellation went into a type of abyss as the demand for fortified wines was going down. 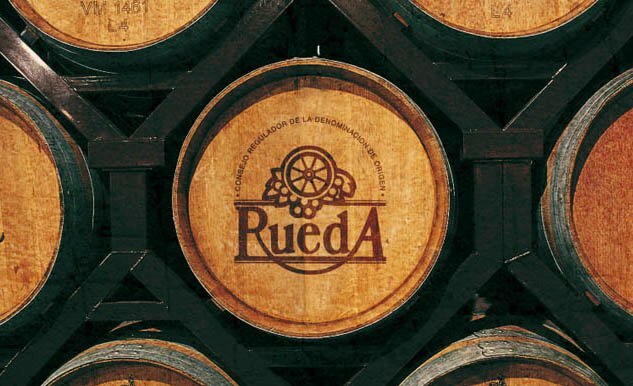 At that time, Rueda was still growing Palomino (Jerez’s pre-eminent variety) and making solera-aged fortified wines, known as Palido and Dorado (pale and gold styles respectively). But the demand for fortified wines was dying. Consumers were losing the taste for these wines, whether from Jerez or elsewhere, and the price was going down fast. What replaced it was Verdejo, Viura and Sauvignon Blanc. 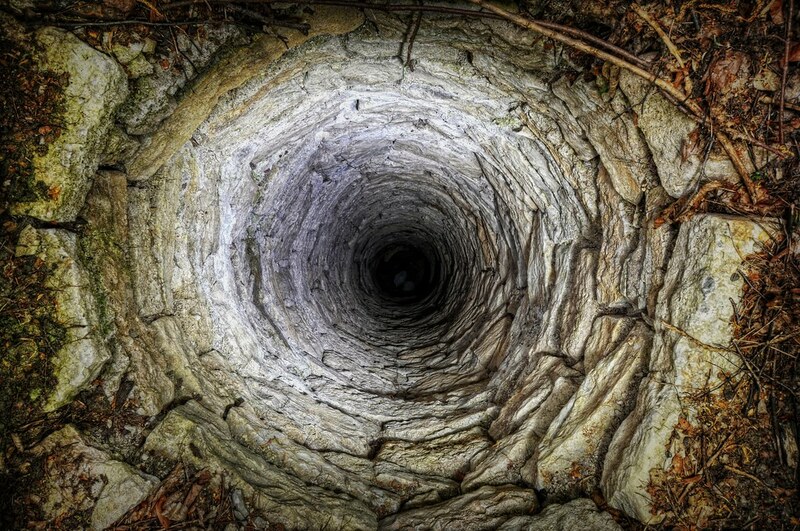 To make matters worse, Viura is declining in popularity,as a blending partner. Sauvignon Blanc replace it in blends and even as a varietal wine. These have generated strong sentiments in the region about their wines becoming international in style. Finally the cherry in the cake, was the cover up scandal in which the D.O try to hide the bad quality of the wines coming up from the 2013 vintage. For more information about this, read the article on El Mundo Vino. These days the tables have turned in Rueda. Verdejo has become a crowd pleaser and as a result big companies have arrived to add a white to their portfolio. They include Freixenet and Codorniu for instance. But they are also some flying winemakers producing excellent whites such as Telmo Rodriguez or Lurton. The SAQ carries around 15 different Ruedas between $14 and $32. This is probably not even a drop of wine in the ocean of Rueda wine. More might be available in the private importation network. If you are lucky, you could taste a few in the Restaurant Tapeo and Meson. From all the Ruedas available in the SAQ, Val de Vid ranks among the best ones. This is a small bodega that has been making artisanal wines since 1996. Their Verdejo that i tasted was their entry level wine. They make other bottlings from old vine Verdejos blended with Viura. They are Condesa Eylo, Eylo and Val de Vid Rueda. Val de Vid is represented in Quebec by LBV International. Impressive nose. Tangy with aromas of lime, passion fruit and green apple with a minerality stream. Medium body,very fresh and vivace.Excellent with seafood salads, oysters and other raw fish and seafood. 93\100. Cannot be better for the price value that it command in these shores. Trialto, one of the leading agencies in the Canadian wine importing business, hosted on June 9th, their second annual tasting. I was in the company of other members of the Quebec wine press. The wine tasting was an intimate gathering and was followed by a fine selection of cured meats and fine cheeses. The Spanish wine presence was quite high, about 30% of the wines tasted. From 17 wines presented, five were from Spain. Most of the wines are available all year round in the Quebec market, with two exceptions that I will mention below. The tasting was more special, because during lunch, we were lucky to have the presence of Juan Palomar from Grupo Artevino. Mr. Palomar is the export area manager for Artevino in the North Aamerican market. This is a group of wine companies led by the Anton family. They include Izadi ( Rioja), Finca Villacreces ( D.O Ribera del Duero), Vetus ( D.O Toro and Rueda) and Orben ( Rioja). I had a nice dialogue with Juan regarding the style of Izadi in Rioja and Villacreces in Ribera del Duero. Regarding Izadi, it is a very special since it marries the traditional style of Rioja with the modern one. I also was pleased with the latest vintage of Pruno. There was more fruit character and less oak. You heard it first in spanishwineguide.com.